While akhand path would be arranged at Gurdwara Ramsar, where Guru Granth Sahib was installed 400 years ago, to mark formal quadricentennial celebrations tomorrow, the illumination of Hindu temples, mosques, religious deras, schools, colleges and even police stations today added to the festivities here today. 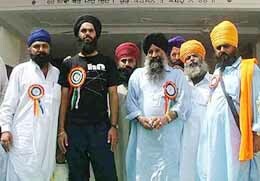 While the Sikh leadership in India, especially in Punjab, is worried over rising trend of ‘patitpuna’ (apostate), a large number of Sindhi Hindus (devout ‘Sehajdharis’) in Pakistan, have joined the Sikh fold by getting themselves baptised. Former the SGPC President Prof Kirpal Singh Badungar today demanded inclusion of two representatives of the SGPC in the committee constituted by the Prime Minister Dr Manmohan Singh, to review history books. In less than a week after illegal fishing was reported from Taakhi village in Gurdaspur, another major case of poaching has come to light in the district, this time about 20 km away from the earlier spot. The state government has no immediate plans to abolish octroi system as an exercise to suggest alternative revenue collection arrangements is still on. An accused in a murder case has alleged that the Fatehgarh Panjtoor police resorted to third degree torture while he was in their “illegal” custody for eight days. The accused, Nishan Singh, has levelled this allegation in a letter sent to the Punjab State Human Rights Commission (PSHRC). Director-General of Police A.A.Siddiqui said that five persons had died in police custody. He said in three cases the police was innocent and in the remaining two, proceedings had been initiated against the erring policemen. Following the Punjab Government's recent announcement clearing the appointment of several next of kin of soldiers who were killed in the 1999 Kargil conflict, ex-servicemen have sought equal status for widows of soldiers killed in other operations as well. Mr Sunil Jakhar, Parliamentary Secretary, Irrigation and Horticulture, said here yesterday the 10+2 education system had completely failed in its principal aim of exploring avenues for self-employment. Hundreds of commuters suffered inconvenience after private bus operators observed a complete strike to protest against the damage to their buses by students on Friday. The Punjab Students Union today condemned the assault on students by private bus operators in Mansa recently. Residents of Jamsher village near here held a demonstration yesterday to protest against a recent decision of the Public Health Department with regard to charging a sum of Rs 2,485 as fee for providing water connection. As many as 10 unauthorised structures were demolished by the Municipal Corporation in various localities of the city here yesterday. The police has arrested four youths, who were allegedly involved in mercilessly beating up of a lottery vendor when he did not fulfil the demand of ransom raised by the accused. The CIA staff has arrested two persons allegedly involved in the business of selling fake CDs and DVDs here today. Commercial art, “the diploma of the future” as it was touted when started at the Government Woman Polytechnic here in 1992, has no takers with not a single being enrolled in the course during counselling being held in Chandigarh by the State Board of Technical Education, even as the final year students of the course have started a “struggle” to demand recognition of the degree for recruitment in government service.